This is the final of three reviews for Gill of RealWeegieMidget’s Adoring Angela Lansbury Blogathon which will take place 15-17 February. Thanks for letting me take part Gill! Brief Synopsis – The minstrel from the forest poses as the king’s jester in order to try and foil a plot to kill the rightful infant king. My Take on it – This is a film that I was intrigued to watch because it pairs Angela Landsbury and Danny Kaye. Kaye is quite hilarious in the lead role and manages to do some outrageous comedy scenarios here yet that unfortunately can’t help this really silly and boring plot feel any more interesting. The story resembles Robin Hood and other medieval tales too closely and lacks a feel of originality that would help it stand on its own. 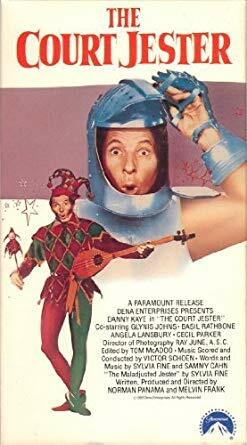 The musical numbers are fun to watch because Kaye is such a great performer and his ability to mix humor in with his dancing gives some enjoyable screen moments despite the overbearing plot. Kaye’s ability to switch personalities at the snap of a finger while his character is hypnotized is quite mesmerizing and enjoyable to watch because he shows how talented an actor he can be. Unfortunately tho, the film doesn’t manage to do anything really special here with the storyline beyond showcasing Kaye’s talent. I’m actually a bit surprised at the choice of Landsbury as the princess who’s father has usurped the throne and wishes to consolidate his power by marrying her off to another key political figure. She feels quite wasted in this role and doesn’t shine like she does in some of her better roles even though it was still nice seeing her here. Bottom Line – Kaye is hilarious in this role but still doesn’t manage to make the story any better. The plot resembles Robin Hood too much and doesn’t feel original enough to stand on its own. The music is fun to listen to especially because of Kaye’s kind of humor. The ability to switch personalities at the snap of a finger while he is hypnotize is some of Kaye’s best work but unfortunately, this film itself doesn’t manage to so anything special enough on its own. Landsbury is interestingly cast as the princess who’s father has usurped the throne and wants to have her wed a powerful ally in order to gain even more power but she is somewhat wasted in this role. Thanks for this lovely contribution to this blogathon, I’m torn about watching this film now having read two different takes on it, but it does sound an interesting early role for Lansbury.